We've recently teamed up with Proxy Studios and Slitherine to bring everyone the Official Pandora: First Contact Wiki at Gamepedia! 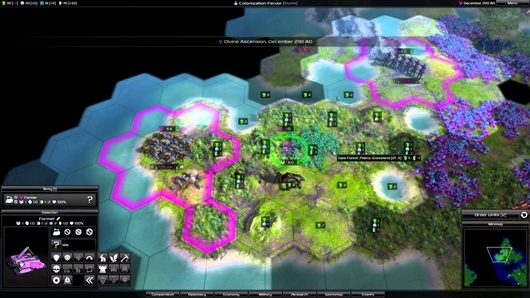 Pandora, inspired by Sid Meier's Alpha Centauri, is a 4X turned based strategy game based in a futuristic, post-Earth world where a new, promising planet has been found, which gives humanity one last hope. As always, where there is hope, expect adversary around every corner! Not only must you and up to five other friends battle the terrain and wildlife, but there are also various factions fighting for control of your new home's resources as well. Pandora is also the name of the new planet you will be exploring and building on, all the while fighting against other factions seeking the same control as you are. With tons of new technologies at your fingertips, you have access to designing your own units, choosing from a great amount of classes, weapons and armors. While exploring your new planet, you will uncover artifacts, choose to work with or fight against nature, work on increasing your colonies by building them out, conduct military operations by commanding the armies you have created and most of all, survive the catastrophes the planet throws at you! Pandora is a survival game as much as it is a civilization and colonization builder. Want to know more about the factions you're up against? How about what you can expect to find on the planet Pandora? The Official Pandora: First Contact Wiki has every resource you could need to be a successful creator of empires. If you're interested in becoming a contributor, the Help Wiki has tutorials to get you started, and you're always welcome to come say hi in IRC, where you can chat with Gamepedia staff and community members!